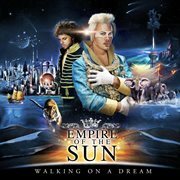 Walking on a dream [electronic resource] / Empire of the Sun. [United States] : Capitol Records : Made available through hoopla, 2008. 1 online resource (1 audio file (44 min.)) : digital. Standing On The Shore (4:23) -- Walking On A Dream (3:16) -- Half Mast (3:54) -- We Are the People (4:27) -- Delta Bay (3:12) -- Country (5:04) -- The World (4:36) -- Swordfish Hotkiss Night (3:55) -- Tiger By My Side (5:47) -- Without You (5:00).